Moist oat flour pancakes with a protein sauce, PB, and froyo. Perfect for breakfast, lunch, dinner, or a snack! Freeze 1/2c Chobani yogurt with cinnamon and 1 packet Truvia. Meanwhile, mix 1/4c oat flour with 2T applesauce, cinnamon, 2 egg whites, 1T ground flax seed, and splash of milk to get desired consistency. Then get 1/2 scoop of the ON cinnamon graham cracker whey protein and mix with cinnamon and some water until you get a syrup-like consistency. 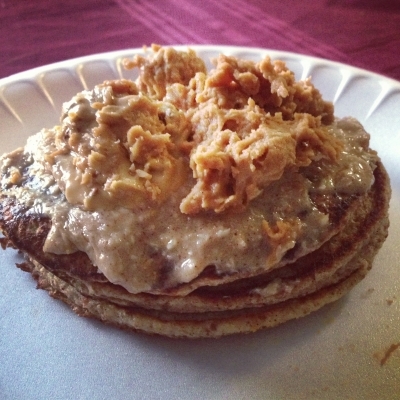 Once the pancakes are cooked top with the protein sauce, froyo, and of course PB or PB2!